So....if you've visited the blog in the last day or so, you may have been shocked or amazed by the changes around here. My last blog design was in 2014, and lately I've been feeling like the blog was due for an updated look. Since we just got our anniversary photos, that helped motivate me--I wanted to use our new pretty photos in the new design! Use this opportunity to take a look around--I've updated my pages and now you can get to them from the navigation bar across the top. My "About" page has a typically Rachelesque description of myself, along with links to the various travel destinations I've covered. The "Book" page is all you need to know about The Cactus Who Craved a Hamburger. "Resources" has some of my favorite useful links from around the internet. "Questions?" is a page I've resurrected from an older design, one that I'm certainly willing to add to if there are any new questions you all have for us! Feel free to test out all of the new, fashionable features of this design-- a great test would be to follow me on your social media of choice by using the social media buttons across the top, or go ahead and use the super-cool hovering "pin it" button when you want to pin a photo from a post! (I didn't even know the template I purchased on Etsy for less than $10 included a pin-it button, so that was a cool surprise for me!). You can even see my Instagram photos on the cool 3x3 grid on my sidebar and follow me from there! Search the blog or follow via email from the handy buttons on the sidebar! When I write something especially touching or useful or hilarious, you can use the ultra-stylish Facebook, Pinterest, and Twitter sharing buttons located below each post to share my awesome posts with the world. Me: I'm not really a musically-oriented person. I used to have a keyboard and taught myself to read music and play as part of homeschool, but have no natural talent or ear for music. I am completely comfortable with silence and am not likely to ever turn on music when I'm on my own, though there are plenty of songs I enjoy. People who are uncomfortable with silence confuse me. Angel: When he's in the car, he has a habit of constantly flipping through radio channels or skipping songs on cds. Never listening to an entire song. Probably because of my lack of affinity for music in general, or just because I'm used to him, I hardly notice this habit, it just feels normal to me, but when other people ride in the car with us, they tend to get quite disturbed by this. A few months ago we were chauffering a bunch of teenagers and they were shouting with frustration because Angel could never seem to let them listen to an entire song before switching to a different channel. Us: Neither one of us has ever bought a TV. We didn't have a TV when we first got married, then somebody gave us one they were getting rid of, the big fat box kind, and that worked great, and we'd watch stuff like America's Funniest Home Videos after Angel would come home from work on weekends. Later, Angel's brother gave us his TV, which was a major upgrade because this one was skinny, and we got Netflix. Our apartment in China technically had a television, because that was part of the work contract, but the television didn't turn on. We haven't had a television set at all for the past two years--I'm more of a social movie watcher, I don't watch any shows by myself, so we'll go to family movie nights at my parents' house, or else Angel and I will just watch a movie on our laptop together. But our home internet is quite awful so no streaming subscriptions for us, it's not worth waiting for the buffering to end. Me: I read pretty much anything. I have a few genres I don't read or don't prefer (I won't read anything super scary, and it's rare for me to read romantic fiction). Kids books are a favorite, along with classic mysteries and adventure novels. Once in a while I'll read a bit of sci-fi or fantasy and I also have a great fondness for educational books--history, geography, true stories. I also read catalogues and cereal boxes and anything that has words and is within arm's reach. I don't really self-help books. Those always seem like the kind of books that spend 60,000 words telling you something you already know. Angel: Plays most sports well, and has boxes of medals and letterman patches and plaques in his parents' house from high school sports. 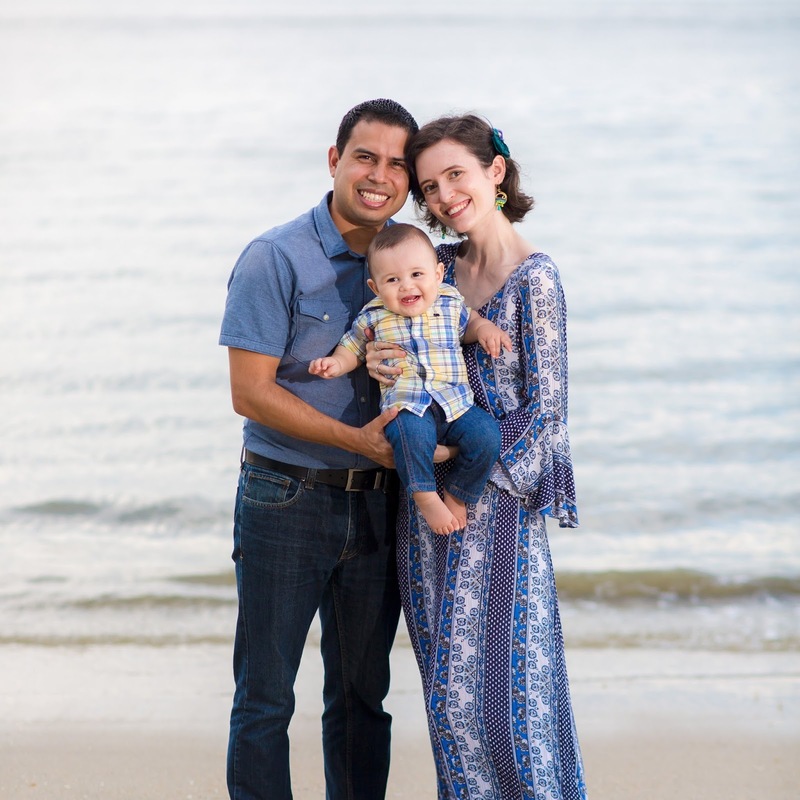 He started out doing cross-country in college, but then found out that real education takes real study time and he left organized sports in order to prioritize his Nursing and Spanish degree. Now he runs 5k about 5 times a week, more miles and more times if he's training for a bigger race, and tries to squeeze in a basketball or soccer game whenever one fits into the schedule! But work and life responsibilities come first! Us: I didn't know Angel was Mexican when we first met. I figured that out about 4 months later. People say things like "Every marriage is a cross-cultural marriage because no two families have exactly the same culture." Which is certainly true to an extent. But it's a totally different extent when you're in an interracial and cross-cultural marriage where you don't even share the same mother tongue or any cultural stories. Angel is really Mexican and I'm really not. Sharing in his culture and his family adds so much to my life. He tells stories of El Chupacabra and La Llorona to my little sisters, and we all benefit from his carne asada grilling skills. But there's things that don't feel quite so natural. I still have to ask what words mean when the topic of a family conversation in Spanish goes over my head. I don't like or cook a number of the dishes that taste like "home" for him: ceviche, lengua, menudo. The flour vs. corn tortilla debate will never end. We have to talk about whether we'll give our future kids Spanish or English names. Me: My favorite animal is a jellyfish. When asked why, I typically answer: "Because they look cool and sting people." Other than jellyfish (and even those I only like from a distance), I don't really like animals. I will ride horses and cats are tolerable at a distance and I might even hold a kitten, but other than that...pretty much no animals. Thankfully, even my animal-loving family members understand this and tell their dogs to leave me alone. Dogs seems to be drawn to me with their inerrant instinct for finding the only person in the room who doesn't want to pet them. Angel: Loves pets, but I'm not sure they love him. He's allergic to cats and dogs. He's known for telling friends and family that he wishes they would post MORE photos of their pets on social media (a statement that I'm pretty sure has never been heard in the history of the world). His favorite dog is Chikis, his mom's chihuahua, but I'm pretty sure they have a love-hate relationship, as evidenced in this video. She's so used to him that she gets pretty defensive the minute he says "It's okay.". Smart chihuahua. Us: I'm an INTJ and he's an ISTJ, which really explains a lot. The fact that I'm so clueless about romance that I had to ask him bluntly if he was interested in me. The reason why Angel's fond of saying he logically decided that I was the best wife he could get. Our shared value for being on time to everything and keeping commitments. My absolute loathing of rules for the sake of rules and inflexible schedules. Angel's calm demeanor and reliability and lack of imagination. That's us! Anything else you'd like to know? I could use a few more questions to add to my questions page, so ask away! I love the new blog design! I also like hearing you mention the realities of being in an interracial marriage, I don't hear people talk about that too often even though there are tons of interracial marriages out there. One of my friends is pregnant with her third, and she has talked a little bit about her husband (who is Mexican) and her debating on what kind of name to give their child. A difficulty she mentioned is that her very-white family may not be able to properly pronounce different beautiful ethnic names that her husband likes! You look beautiful in that red dress. Love it! Also beautiful anniversary picture! This is absolutely gorgeous! I love it so much! It's so bright and clear and organized! I can't wait to click around and check things out!! Also, those photos are breathtaking! You guys are models! Your blog looks awesome! I love your anniversary photo. Have a great week. Such a heart warming post. When my husband and I got married, we thought we had so much in common but with time we learned not so much. Reading your post made me realize how wonderfully different yet similar people are . Stay happy, stay blessed! I would like to also offer you guest writing opportunity as I feel your viewpoint would be wonderful to have on Raising World Children ezine. Let me know what you think. I have an fb group of writers writing togehter (120 strong) where I provide training and collaborative opportunities. Hope to see you there. Also, I will be doing FB live for which I would like to invite you to be a guest so we can discuss culture and life. Please let me know what you think! ps - your book is too cute !! The new design looks great!!! And I am loving that anniversary photo. You look gorgeous in that dress! Stunning photos and congrats on the new design. Starting fresh is always inspirational! LOL at your jellyfish answer. They do look cool! Love the design! Your dress in the picture is amazing! I love the new look of the blog! Sometimes we need a fresh start! I loved reading more about you and I love your anniversary picture, so gorgeous! What a gorgeous gown. Your blog design looks killer. Nice job. I really love the look. It's simple and elegant and easy to navigate. Your pictures are absolutely stunning too. Such a wonderful introductory post to kick off the new design too! You two are the sweetest! I love the design and reading more about you and Angel. Beautiful gown. I love TV by the way. Probably too much. I'm new here so I'm not sure what the old look was like, but I LOVE the new look! And I'm loving the comparison between you and your spouse. It's so amazing how we can be so different and so similar at the same time. Only God can do that! Rachel! Congrats on the new design. I enjoyed getting to know you via this post!! It looks fantastic! And your pictures look amazing too! Your new blog design is stunning! I love your whole re-introduction!!! I love the new design! Very nice. I love the new look! Its so clean and fresh! Aw, your photos are so cute! Love the new design. It's nice to get it updated here and there. I liked getting to know you two a little more! Love this! Your pictures are amazing. I remember reading your blog years ago, and I remember the design. I love the update. It looks great, and your photos are gorgeous! Loved the new layout!!! I too have been thinking of changing mine up a bit. I too enjoy sitting in silence! Those who do not like it confuse me as well. It's so nice. Loved getting to know more about you and Angel! Love your new look! Also that dress is GORGEOUS! I love the simplicity of your new blog layout--it's so pretty too! :] Your anniversary photo is gorgeous as well! I haven't changed up my layout since...I don't even know anymore (probably 2014 also, actually)--maybe one o' these days/years?! The blog is looking great! I loved reading about you two in this post!! I absolutely love the new design! So chic! It was also super fun learning more about you two! Your new design is so elegant! You're a lovely lady, and I enjoyed learning more about you and Angel. This made me smile -> "Angel's fond of saying he logically decided that I was the best wife he could get." He apparently is a smart man. You two are so adorable. I love this!!!! I really enjoyed learning about you! First of all, I LOVE the design, and the gorgeous pictures of you two. Secondly, I love all these random tidbits! I don't think I could ever get behind lengua - the thought of it kinda grosses me out. There are a ton of food preferential differences between Pai's family and mine. I remember once we sat down to eat dinner and I thought there was a plate of shredded bbq chicken in front of us and then his mom said, "Do you see those eyes?!" and I looked closer and it was not chicken . . . it was a small fish with the eyeballs still in it. I took a courtesy bite and have never put another one in my mouth. I'm personally a fan of family names, so y'all should name your future kids some beautiful combination of your family and his family names. I'm also not an animal person, but that's because I'm allergic to anything with fur. I love snakes, though. I love the update! I have been totally disconnected from the blogging world over the past few months but a rainy Sunday afternoon has drawn me back into blogland. I'm looking forward to catching up with all your adventures! Congratulations on publishing a children's book! What a huge accomplishment!